The Mountain Chalet is not available for online booking. Please submit an inquiry or call our agents to get pricing and availability information. 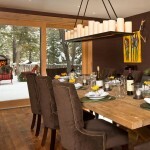 The ultimate opportunity to stay in an incredibly rare, true ski-in ski-out, quintessential luxury ski chalet on the slopes of iconic Jackson Hole Mountain Resort. Unobstructed views of the tram, ski slopes and Jackson Peak across the valley combined with unmatched ski access and custom craftsmanship add up to make this home the height of luxury. 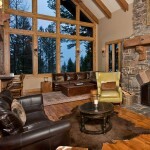 This custom mountain chalet is especially noteworthy for its highly coveted setting within Teton Village of being one of only 21 homes at the resort bordering the ski runs. 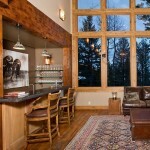 Add the pristine and rustic stylings of a highly custom crafted home coupled with Jackson Hole’s legendary terrain and this is the ideal Jackson skier’s dream home for an extended stay this winter. 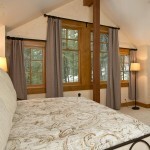 Spacious master bedroom with king bed, gas fireplace, seating area with sofa, large picture window with mountain views, walk-in closet, and private access to the outdoor deck. The spectacularly customized en-suite master bathroom is appointed with marble, surround sound, dual water closets, dual vanities, bidet, towel warming drawers, small sofa, large dual head shower, and deep soaking tub. The king guest bedroom includes king bed, sofa sitting area, picture windows with mountain views and en-suite full bathroom. 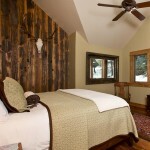 Twin guest bedroom with two twin beds and en-suite bathroom with shower-tub and dual sink vanity. Top floor guest bedroom with king bed, flat screen TV, with en-suite full bathroom and adjacent kitchenette. 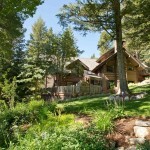 True ski-in/ski-out private home adjacent to the Union Pass run and accessed by the Union Pass chairlift. Spacious great room ideal for entertaining features vaulted ceiling with hand-hewn beams, large picture windows offering amazing views, massive wood-burning fireplace, and full wet bar with Subzero fridge and ice maker. 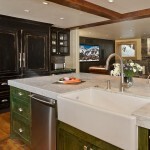 Large chef’s kitchen includes Subzero fridge, 48” range with dual ovens, two dishwashers, Carrera marble and satin-finished granite, walk-in pantry, and breakfast bar seating with four leather barstools. Open floor plan features large dining area with table seating 8 and access to the back deck. Family room adjacent to the kitchen boasts a 65” built-in flat screen TV with surround sound, wood burning fireplace, and direct access to large back deck. Media lounge featuring 80” TV with surround sound and game system, ski area views, foosball table, and adjacent half bath. Laundry room with marble floors and high-end front-loading washer and dryer. Outdoor living area with in-ground hot tub, and terrace with fireplace and dual grills. 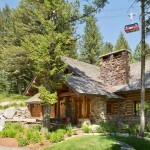 Heated garage parking for one vehicle includes treadmill, Subzero fridge and freezer, ample ski and snowboard storage.